Samsung is one of the biggest smartphone manufacturers in the world. It’s due to its vast range and the company has been continuously adding new phones and features to stay at the top of the game. The latest offerings are Galaxy A3, Galaxy A5 and Galaxy A7 under Galaxy A 2017 series, which offers some of the features of flagship phones at a much more affordable price. Let us have a look on them. The latest A series from Samsung has features from the successful S series which improves the overall experience. On the design front, all three variants are equipped with curved 3D glass at the rear ends and minimum bezel like S7 series, the flagship device of Samsung. It really looks nice in hand and gives the true feeling of Galaxy S range as well. Camera bump has also been changed in refined A 2017 series and shaved from 1.3mm in 2015 to 0.7mm. Just like Galaxy S series, all three models of Galaxy A series have IP68 certification for waterproofing, always on display, and microSD card expansion and a durable battery. That means you can have a phone with IP68 certification at a very less cost and it’s always on display feature makes you feel that you are using Galaxy S7. The Galaxy A3 2017 sports a 4.7-inch 720p display, the A5 has a 5.2-inch Full HD display and the Galaxy A7 has a larger 5.7-inch Full HD 1080p screen. All of them have Super AMOLED displays and offer vibrant colors, rich saturation, and deep blacks we’ve come to expect from Samsung’s displays. All three models have advanced camera. The A3 offering a 13MP rear and 8MP front camera, and the A5 and A7 have a 16MP camera on the front and back end. All lenses come with a f/1.9 aperture for better low light photos and the Galaxy A5 and A7 also have Phase Detection Autofocus for lightning fast focus times. The Galaxy A3 is powered by Samsung’s quad-core Exynos 7870 processor with 16GB of storage and 2GB of RAM, while the A5 and A7 feature a slightly better Exynos 7880 CPU, 32GB of storage and 3GB of RAM. They also come with USB Type-C ports. The fingerprint sensor is a built-in feature into the home button of the screen in all three models (A3, A5, and A7). Apart from these features that are similar to Galaxy S series, the Galaxy A family is equipped with a useful feature called floating shutter. It allows you to place camera shutter button anywhere on the screen by dragging it. That will be helpful to solve you the problem of cramping your hand while reaching down to take a selfie. The galaxy A series has a camera with a simple Swipe UI which enables you to swipe up or down to flip between the cameras left to change modes. It’s simple but rather effective also at the same time. Galaxy A series 2017 is available in four different colors as Black Sky, Gold Sand, Blue Mist, and Peach Cloud. 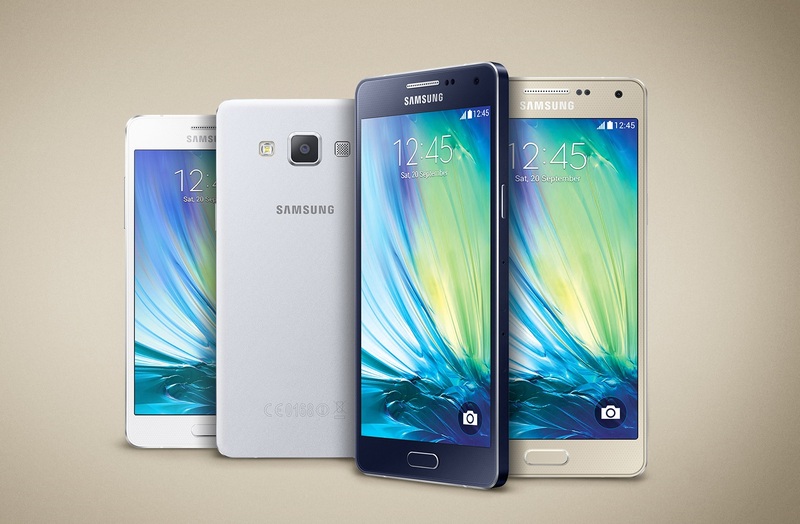 The Galaxy A3 is available at 279 GBP while A5 costs 369 GBP. Since A7 is not available in the UK but costs somewhere between 450-500 GBP.